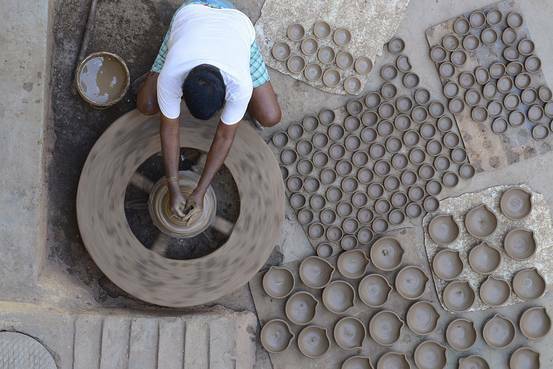 A woman arranged clay lamps, or ‘diyas,’ for the upcoming Diwali festival in Mumbai, Oct. 30. These diyas traditionally filled with mustard oil are placed are lit and placed around entrances to homes during the festival. 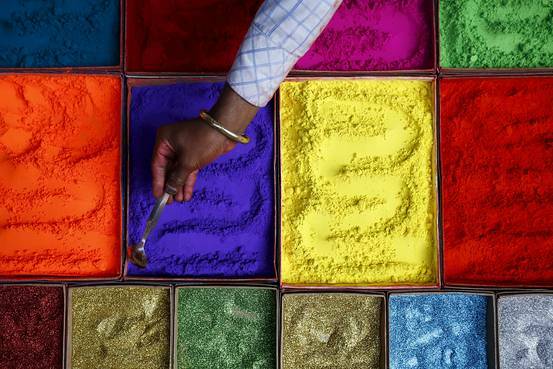 India celebrates Diwali, the Hindu festival of light on Wednesday. Diwali marks the triumph of light over darkness and the beginning of the Hindu new year when it is believed the Hindu god Rama returned to his capital city of Ayodhya after 14 years in exile. Diwali, means “row of lamps” in Sanskrit. 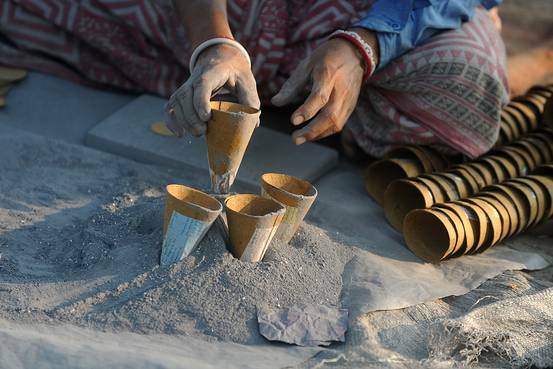 An Indian potter made clay pots or ‘diyas’ ahead of the Diwali festival on the outskirts of Hyderabad on November 3, 2015. Dates for Diwali vary each year depending on the lunar calendar. 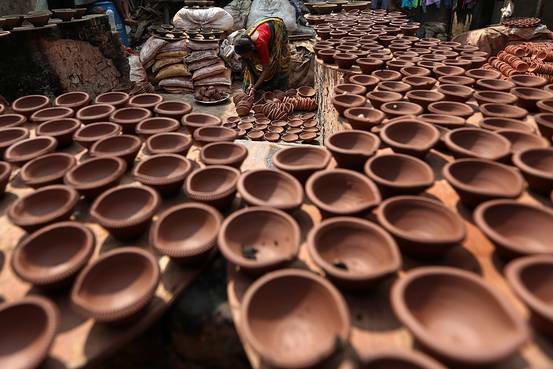 Indians celebrate the festival by lighting earthen lamps, eating sweets, exchanging gifts and setting off fireworks. A woman colored ‘diyas’ ahead of Diwali in the northern Indian city of Jammu, Nov. 3. Indians worship the Hindu deity Lakshmi, the goddess of wealth, during the festival. Ancient Hindu texts suggest that on the main day of festival, which this year is Wednesday, the goddess descends on to Earth looking for the cleanest household to bestow her blessings. Devotees light clay lamps, or ‘diyas,’ to welcome Lakshmi into the house. A woman worked at a firecracker factory on the outskirts of Siliguri in India’s east, Nov. 4. Celebrations also include bursting firecrackers. In recent years, anti-noise campaigners say the noise firecrackers make has reduced. Click here to find out more about Diwali getting quieter in India. 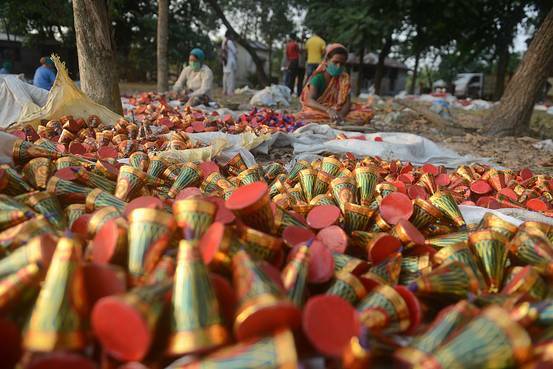 Firecrackers at a factory in Siliguri. Nov. 4. The deity Kuber is also worshiped during the festival. He is regarded as the treasurer among Hindu gods and his presence is to help those who are good at earning money but not so good at saving it. During the worship of Goddess Lakshmi Puja, the deities Lakshmi, Kuber and Vishnu are offered a mixture of coagulated cow’s milk, sugar, cardamom and cloves. 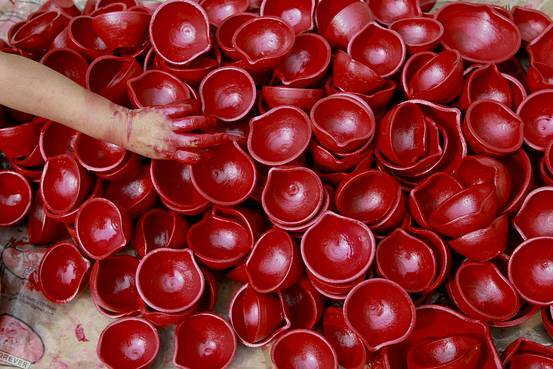 A vendor spread vermilion powder used for worship during Diwali in Kathmandu, the capital city of Nepal, Nov. 9. Celebrations for Diwali last for five days culminating with Bhai Dooj (also known as Bhaubeej, Bhai Tika or Bhai Phota depending on what part of India you’re in) a festival similar to Raksha Bandhan, which celebrates the relationship between brothers and sisters. Sisters pray for health and prosperity of their brothers and mark their foreheads with colored powder. 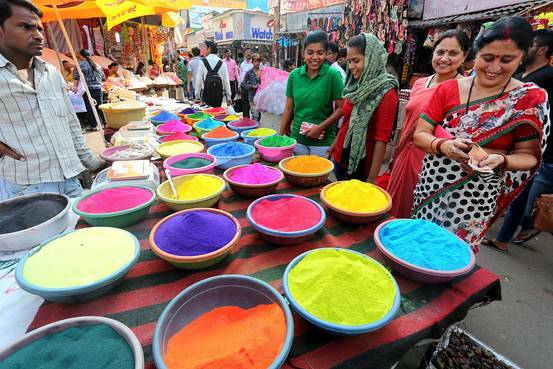 People buy colors for decoration ahead of Diwali festival in the western Indian city of Bhopal, Nov. 6. 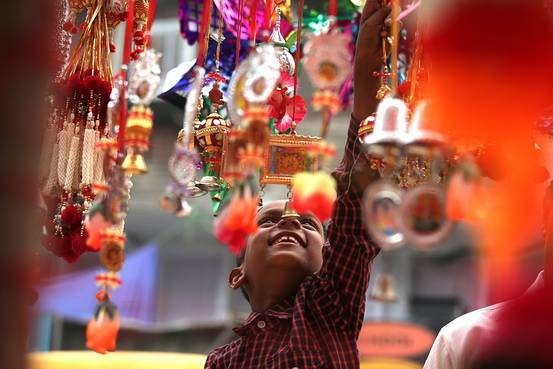 A child looked at a display of decorative items at a street ship in the northern Indian city of Amritsar, Nov. 9. 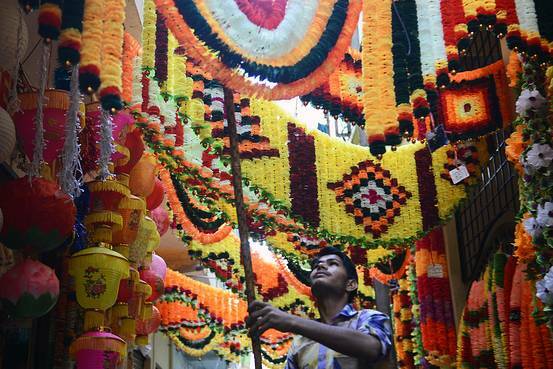 A shopkeeper arranged lanterns and plastic garlands for sale ahead of Diwali in the southern Indian city of Hyderabad, Nov. 4. 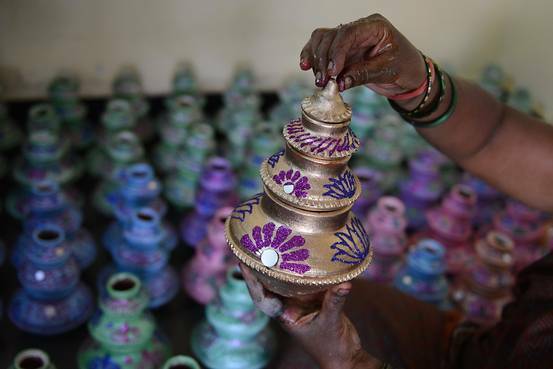 A woman decorated earthenware oil pots, or ‘diyas,’ in the southern Indian city of Hyderabad, Nov. 6. This entry was posted in India, Religions of the World, Travel, Uncategorized and tagged blogging, celebrations, Diwali, Hinduism, India, New Year, photography, tourists. Bookmark the permalink. Great post and I hope you had a great Diwali ~ probably missing India quite a bit this past week! Oh yes, I would be there or on the way soon! I just love the colours they use! Me, too and you see them everywhere. . . food, clothing, scarves. . . . so joyful. Even the poorest women have colorful saris . . . may have only one but it is Indian bright!